Put the meat cubes, and lemon and onion slices in a large bowl. Remove the leaves from the dill and parsley stems, chop up the hard stems (the leaves will be used later on), and toss them into the bowl. Add the salt, black pepper, red pepper flakes and 5 tablespoons of vinegar. Mix thoroughly with your hands. Cover the bowl, and allow to marinate overnight in a cool place. Build a hot charcoal fire in a grill. 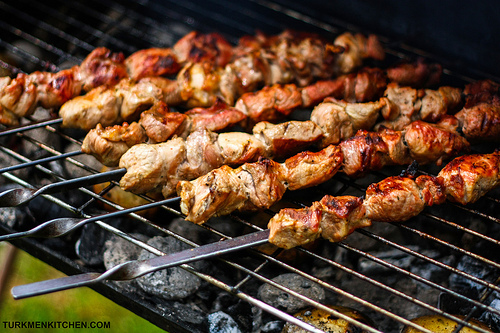 Thread the meat cubes tightly onto the skewers, and grill, turning frequently, until the meat is cooked throughout. If your fire gets too strong, drizzle some vinegar-added water over the skewers from time to time. Chop up the dill and parsley leaves, and sprinkle them over the kebabs along with the chopped spring onion. Drizzle with 1 tablespoon of vinegar. Serve with flatbread or rice pilaf. I’m so excited to have found this page. We are going to make Shish Kebabs this weekend and I will try this recipe and let you know how it turns out. Thank you! Thank you Samantha. Hope it turned out great! I am so excited to have found your blog. I have a classmate at our college that is from Turkmenistan and he is coming to my house for Thanksgiving. I want to have something at the dinner that he is familiar with. I am excited to have found so many new recipes to try!